Pansies and their petite cousins, violas, can be planted in March and April, and don't even mind a dusting of snow! There are a handful of plants and flowers that thrive in the very early spring here in Iowa, and don't mind even a dusting of snow now and again: cool-season annuals. Pansies and violas are the most popular and readily available of cool-season annuals. They also seem to be the toughest. They can easily weather temperatures well below freezing and, in fact, start to get brown and ragged-looking when temperatures regularly start hitting 80° and 85° degrees. Other good cool-season annuals for Iowa, if you can find them for sale, are pot marigold, diascia, annual lobelia, nierembergia (especially 'Mont Blanc'), and snapdragons. Buy as established plants, though there are cool-season annuals (such as larkspur, California poppies, and johnny jump-up) that are good to direct snow into thre ground once the snow has melted. Pansies and violas seem to do best in Iowa when bought as established plants. For most gardeners, it's not worth the effort (and limited success) of starting them from seed indoors. 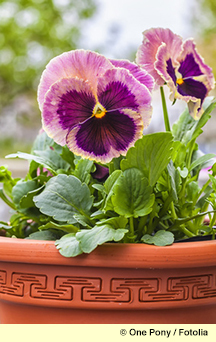 Pansies seem to do best when in containers, windowboxes, and planters--places where we can really see their precious early-spring color up close and personal. The also appreciate the good excellent drainage of containers. (Iowa flowerbeds in March and April can be soggy, snow-covered places).And while these cold-hardy little flowers don't mind a dusting of snow, they have fragile stems that can snap in the hurly-burly of the regular flower bed, where sticks and animals and mud can take their toll. A bonus of planting in containers: If the weather threatens to get really cold, you can bring them inside for a day or two. I like to buy pansies and violas just about as soon as I see them in garden centers, usually about this time of year, though you're safest if you wait until April. My favorite way to use them is to plant them to fill two or three medium-sized pots to put by my front door. That way, I can plant them and enjoy them inside for a week or two. But they need full sun, so then I can set them outside once it's a little warmer.